In my previous two posts I showed you how to convert your Our Generation Ice Cream Truck into a TACO TRUCK. I also showed you yummy treats that can be purchased from Dolly’s Dining Room to stock your truck. 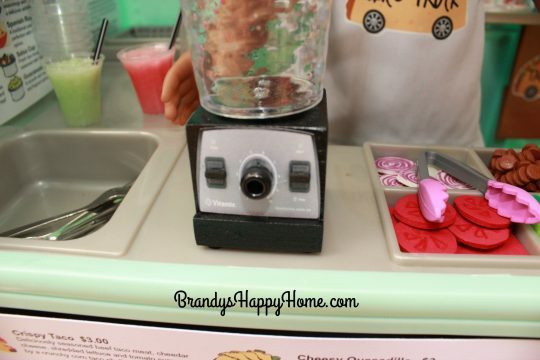 Today I will show you how to make a doll sized blender so your doll can create those tasty frozen drinks! 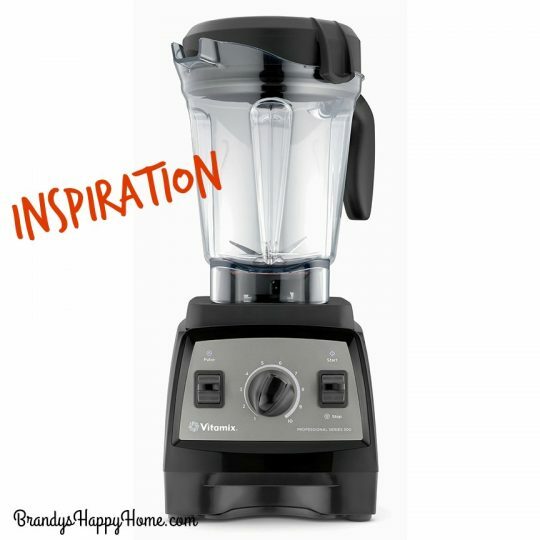 Blender inspiration came from our own real Vitamix 300 series blender. We LOVE this blender! This blender is used at least once daily to create our morning smoothies and is often used to create yummy milkshakes in the evening. My daughters wanted a doll version! 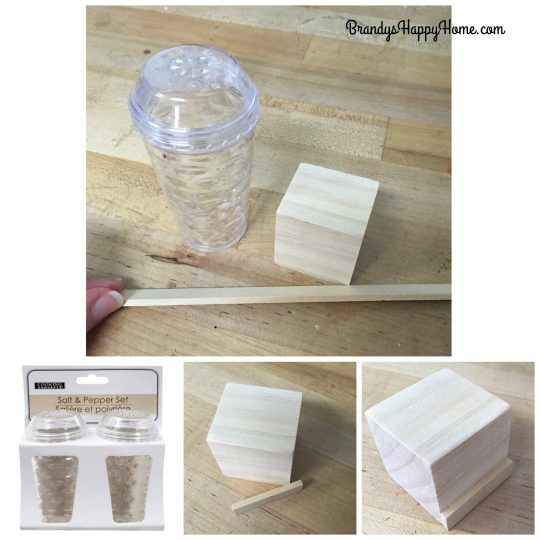 Main parts for the doll Vitamix blender included a plastic salt shaker from the Dollar Tree store, a 1-1/2 inch wood block found at Michaels Craft Store, and 1/8 inch thick wood rectangular dowel rod found at Michaels Craft Store. The wood dowel rod was cute down to the width of the wood block and glued in place with wood glue. These wood dowels are soft wood and can easily be cut with a utility knife. I used a small tood coping saw. You can add spackling too fill in any gaps if needed. The wood was then painted with Rustoleum semi-gloss black spray paint purchased from Lowes. A front buttons panel was created, printed and cut. It was glued with a glue stick to the front of the block. You can find the Vitamix Panel Printable here: Blender. A black pony bead was glued over the center to mimic the speed selection knob. I used a rectangular hand punch and punched two small rectangles from black foam paper and glued in place over the images of the switches to give a 3-d effect. For the doll Vitamix blender handle I used a 5/16 wood dowel rod cut to 1-5/8 inches long. This piece was glued with Aleene’s glass glue to a black and clear pony bead, once dry it was then glued to the salt shaker. Tip: remove lid of salt shaker prior to doing any gluing to prevent glue from accidently getting in rim and preventing you from opening the shaker. I used grosgrain ribbon around the lid base to give it black trim. 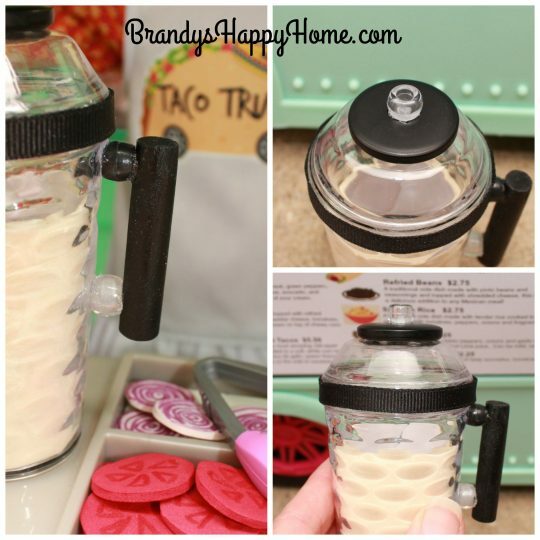 A one inch black button was glued to top of salt shaker lid and a clear pony bead was glued on top of button to finish the blender lid. Pre-stick squares of black Velcro were used on top of the base and under the carafe to secure attachment to each other during play. To create the look of the carafe being full I simply cut a piece of craft foam and inserted inside. The texture of the carafe is very forgiving and you can’t tell that it is filled with a solid. 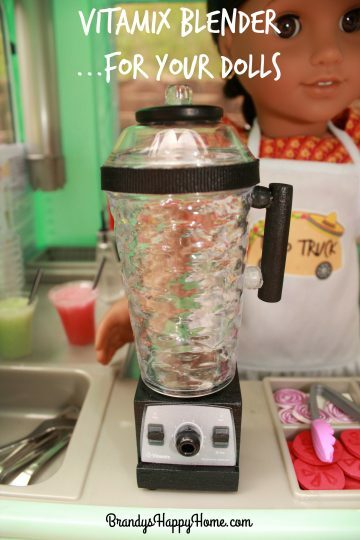 Here the doll sized Vitamix blender is already at work on the Taco Truck! The doll Vitamix is pictured with Horchata. This traditional Mexican rice drink is sweet, cool and refreshing, and is infused with spicy cinnamon and garnished with a cinnamon stick. The doll Vitamix is also pictured with Agua Fresca. Agua fresca is a light fruit drink popular throughout Mexico. It’s simply made by blending fruit with water, a bit of sugar and a little lime juice, and it is as beautiful as it is refreshing! Comes in your choice of two flavors, Watermelon or Honeydew. All of these doll drinks can be purchased at http://www.DollysDiningRoom.com . Let me see you create your doll blenders! Craft on! Ginnie, this blender would be perfect for Lea’s fruit stand! I LOVE this, very clever! I had a trip to Dollar Tree today anyhow, have salt shakers ready to go. I’ve been wanting a blender for my doll kitchen, this is just too cute. That’s awesome Flo! Send me pics of your finished blender; I would love to see it! This is Brilliant! I tried to figure out how you made the blender before I read the directions and I was stumped. You bring such inspiration and I love using your ideas with my granddaughters. Thank you for your generosity in sharing your ideas with us for free. You (and they) are a tremendous gift! Thanks so much Linda! Have fun crafting with your granddaughters! So creative Brandy! Love it! Thanks so much! I love that you are happy with this craft! Makes my day!